The Canal D’or Awards 2017 may have recognized and celebrated talents in entertainment but did they fail to recognize how poorly organized they still were on their “Act 11” edition and how disrespectful it was for them to had kept the First Lady, Chantal Biya out of her husband’s house until past 2:00 AM? 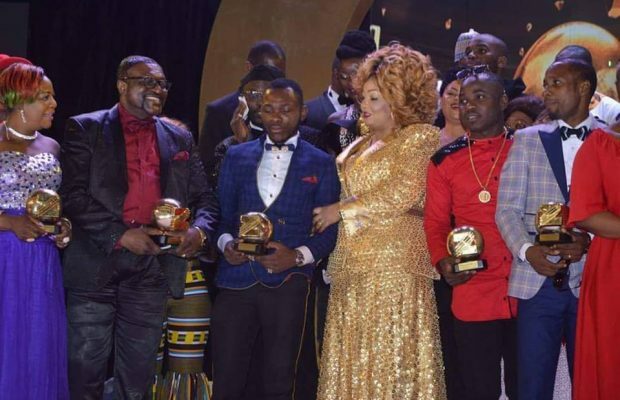 The Canal D’or Awards is undoubtedly the biggest and most watched entertainment event on television in Cameroon (besides the President’s New Year’s Eve speech) and the organizers have worked so hard to keep its reputation afloat for 11 seasons. Bravo! However, the award show still carried particles of confusion, lack of proper organization, no respect for time, loss of style and yes, it failed to use its big stage to call for peace and reconciliation between the Southern Cameroons and La Republique du Cameroun – an ongoing fight which has led to the cut of internet connection in Southern Cameroons and kept their fans in the English-speaking part of the country not to participate online in making the award show the number trending topic on social media Saturday night! Oh yes! The award show completely ignored the “Anglophone Problem” and the issue of “police brutality” in the English regions despite the fact that Anglophone entertainers currently contribute to over 60% of entertainment content in the country. It seemed bizarre that Canal D’or totally forgot to relay the English speaking entertainers’ problems – lack of internet and peace – to their guest of honor, Mrs. Biya. Instead, it was a foreigner, Congolese singer, Idylle Mamba who won “Best Artist Central Africa” who advised the First Lady not to allow Cameroon plunge itself into an unnecessary civil war like her country did few years ago. This act alone begged the question: What do you use the Canal2Or platform for if you can’t even talk about a major trending topic on your stage? The award show had the ability to send a strong message using their entertainment platform but boy did they miss the point. Out of four (too many) hosts, only one was speaking in English and at some point she couldn’t even keep up with the language. As much we would like to give kudos for having great sound throughout the show, viewers at home had difficulties with the images from the red carpet as the lighting was beyond horrible. Getting on stage, some of the hosts forgot they were simply emceeing an event and thought they were anchoring a late night radio show – too much talking was only wasting everybody’s time. Seating positions at the Canal D’or was a major call for concern. Looking at the Grammy and Oscar Awards as well as the Africa Magic Viewers’ Choice Awards (AMVCA), nominees are usually seated in one place with enough space for them to navigate to and from the stage but that wasn’t the case with Canal D’or. Instead government officials had the first 5 rows even though they were not recipients of any award. Artists were placed randomly across the room leaving many struggling to get on stage on time to collect their trophies. When it came to the categories, it was an all-French affair! Out of close to 25 winners, only three came from the Anglophone zone – Mr. Leo, Reniss and founder of NS Pictures. To make matters even weirder, the organizers had to force Mr. Leo to share his award for Best Male in Urban Music with Locko – just to have a francophone artist on board. Oh did we forget to mention that the category for “Male Artist of the Year” had almost no contemporary male artist on it, except the winner Dynsatie Le Tigre? So, were the Urban Music categories created so that these artists won’t participate on the biggest award category of the night? Instead old Makossa musicians featured as if the country today listens or download their music – wait, on which platform, iTunes? Which radio countdown shows have these old Makossa records topping their lists? Why was Jovi, Stanley Enow, Locko, Mr. Leo, Salatiel, Maahlox, Franko, Michael Keissou, Minks, Tenor etc exempted from the “Male Artist of the Year” category? Things got even more bizarre when the close to 21 nominees from the Best Actor and Actress, Best Humorist and Best TV Series categories all went to Francophones stars. Excuse me! The night was good only it wasn’t great and to think it was an 11th edition, it was a shame that the prestigious Canal D’or Awards – with all its glamour, publicity and sponsorship – is still to grow up to some level of maturity.